If you’re reading this post it means you are looking for an alternative to display home builders and in that case, need a custom home builder such as Renmark Homes who has years of experience building stunning, architecturally designed homes. Sometimes you just don’t want a cardboard cut out of what the rest of the neighbourhood looks like. Your home should reflect your personal style and your lifestyle, not the set designs of homes where you have very little room to move – literally. Renmark knows the difference as we, in our past, used to be involved with the building of display homes but now we are purely custom builders who also specialise in dual occupancy and sloping block building. So what are the differences between a display home builder and a custom home builder? Here are some common questions. Is there a difference in cost between display home builders and custom builders? Display home builders are working more on economies of scale so the designs are similar and the inclusions list is more basic and hence, you will find that display homes suit a home builder who is on a budget. Often, we at Renmark Homes, find we are building second homes for people who appreciate the importance of a home to suit their living. Do Custom Home Builders have Display Homes? It’s fairly unlikely that a custom home builder has display homes although you may come across the odd one that does. A display home is generally a point of sale for the rubber stamping of set designs. While Renmark Homes does not have display homes, we should be able to take you through one of our finished, custom built homes to show you the quality of the design layout, floor space use and fittings. Having built many homes, we have years and years of experience and know what it takes to build a prestige home. Every one of our clients or potential clients that comes to us either has a house plan or design in mind or wants help to have a custom home designed and built. So, every home is unique in some way. 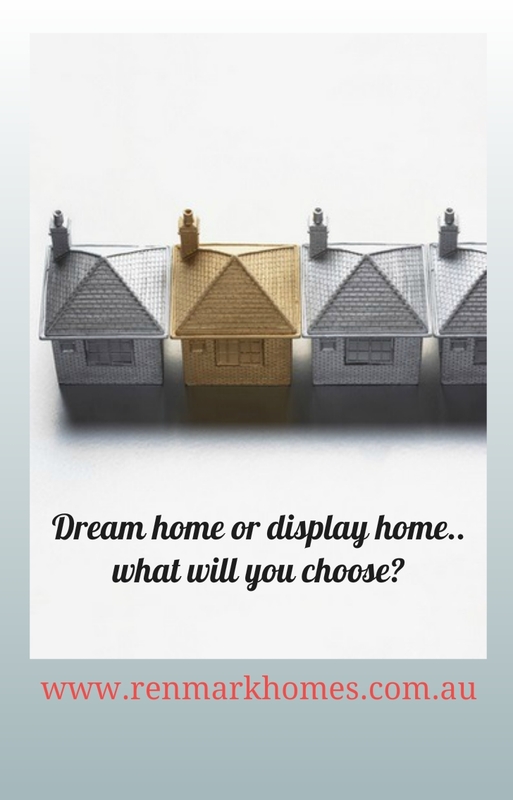 If you are looking at a display home then you will have a choice of maybe 3 or 4 per estate and this will depend on the package available and your budget. 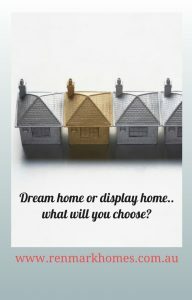 There may be 3 options for a 3 bedroom and 4 options for a 2 bedroom display home style of house. The beauty of a custom designed and built home is that your options are your own and this makes us a great alternative to display home builders. Are Display Homes Built in the Same Location as Custom Homes? Often, display homes are chosen and built within a certain allotment. While it may be in the same area, it is generally different to custom built homes in that it may be a development estate as opposed to a straight up block of land for a custom built home. You will be directed to land developments and then it will be based on land size and home size. Custom home designs can be built closer in to the CBD as you are not part of a larger scale development. These larger developments need larger sized land and it’s simply not available closer to the city. Do you still get a quality build with a display home? Yes, you can still get a home that is well built and as long as you use a registered builder and follow some crucial steps to choosing the right builder then you can still find yourself in a nice home. It just might not be your dream home. Remember that display homes are more limited and made to attract those who do not have the budget for a home with all the trims they desire. If you do want a custom home then why not save a little longer so you are not compromising. Sometimes waiting a little longer can be worth it. Talk to us about the process of when to buy land and planning or designing your home as opposed to building it. You may be able to start the process and have everything ready to go before you commence. It’s certainly worth a conversation with us. Is It Possible to Compare A Building Quote From A Display Home Builder to a Custom Home Builder? It’s pretty much not possible as a display home builder has set plans, set land sizes and set development including fittings. A custom builder builds based on select, unique design and to a lifestyle that suits. You’re really not comparing the same thing. We are worth considering as an alternative to display home builders. Renmark Homes is a family run business that has been building for over 20 years. We are registered builders and a HIA Green Living and Green Smart Professional. We know how to build so let us design and build the home you want.